There’s new life to an effort to ban local governments in Texas from requiring that private employers provide paid sick leave. As we previously reported, what would have appeared to be a classic business versus labor fight quickly became more complicated when social conservatives pushed to remove protections for LGBT Texans from a key piece of legislation. Sen. Brandon Creighton, R-Conroe, originally filed a bill that would stop cities from mandating paid sick leave, along with other employment regulations, while specifically protecting the ability of those cities to adopt nondiscrimination ordinances including protections for the LGBT community. Sen. Creighton’s bill appeared to be dead in the water, though, after he abruptly removed those protections at the behest of Lt. Gov. Dan Patrick, a staunch social conservative. That move concerned groups like Texas Competes along with leaders of local chambers of commerce who believe protections for LGBT folks are good for business. Other business groups, including members of a coalition called ASSET, argue the new language does not threaten nondiscrimination ordinances. “It’s clear from our many conversations with business leaders, as well as from their long history of inclusion and support of the LGBTQ community, that Texas job creators highly value municipal nondiscrimination ordinances,” said Jessica Shortall, Managing Director of Texas Competes Action. Sen. Creighton responded to the concerns by filing four new bills which are sort of like bite-size pieces of his original bill. They are: employee benefits (SB 2485); scheduling practices (SB 2486); employment leave (SB 2487); and criminal history requests, often known as "ban the box (SB 2488). Shortall said the new bills still fall short. “There is a simple fix that should be amenable to those advocating for preemption – including businesses that have been and continue to be valued partners and staunch advocates for LGBTQ equality: Re-insert the language that clears up all conflict and ensures that this legislation does not impact municipal nondiscrimination ordinances that prohibit discrimination against veterans, people of color, people of faith, people with disabilities, LGBTQ people, and more,” Shortall said. It does not appear that it was the intent of Lt. Gov. Patrick to undercut nondiscrimination ordinances. But his actions in promoting restroom restrictions over the last two years have colored impressions among some in the business community about what he may be trying to do. For his part, Sen. Creighton argued in a committee hearing this past week that his new bills are “narrow” in nature and strictly limited to employment practices. He said it’s not unusual for legislators, including himself, to offer new language even at the eleventh hour as he did with this issue. 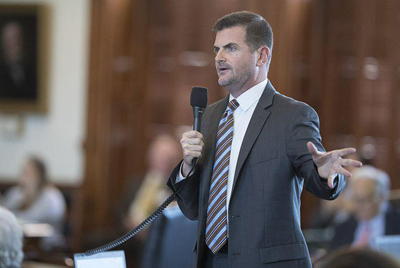 Sen. Creighton also said it is not necessary to reinsert language specifically protecting LGBT Texans because his original bill, Senate Bill 15, was broad in scope and his four new bills narrowed it down to a specific list of things that cities would no longer be allowed to do – like mandating paid sick leave. When he abandoned sweeping legislation the nondiscrimination ordinance language was no longer necessary, he said. “When you don’t want litigation, you just remove it altogether,” Creighton said. During that Senate hearing, most of the people who testified were in favor of Creighton's efforts, including builders, contractors, small businesses, apartment owners, and the travel industry. The bills were passed out of committee and are on their way to the Senate floor. There has not been a hearing on similar legislation in the Texas House.